We are used to thinking of Henry as obese, ailing, suspicious and vindictive but he wasn’t always so. We know from contemporary descriptions of him that in his youth he was athletic, talented and cordial; a perfect example of a Renaissance prince. I have discussed in previous posts the degeneration that took place during Henry’s mid-life resulting in the ‘monster-king’ we know and love, but today I’d like to go further back to Henry’s infancy. There are many questions I want to address. What sort of child was he? Did his upbringing have any bearing on the king he was to become? Or did his childhood relationships with women impact upon the way he treated the women he was to encounter as an adult? And to what extent did the constant rebellion that affected his father’s reign impact upon Henry’s crushing need to produce a male heir? Henry was born at the Palace of Placentia in Greenwich on 28th June 1491. He was the third child of Henry VII and Elizabeth of York. As second son he was never intended for the throne; that honour was to go to his older brother, Arthur, a boy who, as far as we can tell, resembled his father both in looks and manner. Henry was more like his maternal grandfather, the giant, bright haired Yorkist king, Edward IV. This likeness seems to have been more than just physical and in several aspects the lives of the two kings bear similarities; both married for love, both shared a love of fine cuisine and both were subject to violent outbreaks of temper. Like most royal children Henry’s early life was governed by women. While Arthur, as heir to the throne, was given his own extravagant male orientated household at Ludlow, Henry shared a nursery with his sister Margaret, and later his other siblings joined them. It was a world of women, very different to that of his brother. Henry’s wet nurse, Anne Uxbridge, provided nourishment in his early years while his two rockers, Margaret Droughton and Frideswide Puttenham, saw to his other comforts. As Elizabeth of York continued to dutifully fill the royal nursery, the role of ‘lady mistress of our nursery’ was bestowed upon Elizabeth Denton who served in the queen’s household long after the children had outgrown their need of her. This team of women who cared for the royal infants should not suggest that Elizabeth kept her children at arm’s length. In fact Elizabeth seems to have been exceptionally close to her younger children. With Arthur far from court and growing up almost a stranger, she took an active role in the upbringing of his siblings. David Starkey suggests that Henry’s handwriting is so similar to his mother’s that it can only indicate she had a hand in their early education too. It is widely accepted that Elizabeth was fond of her father and it is very likely he would have featured in the stories she told of her childhood. 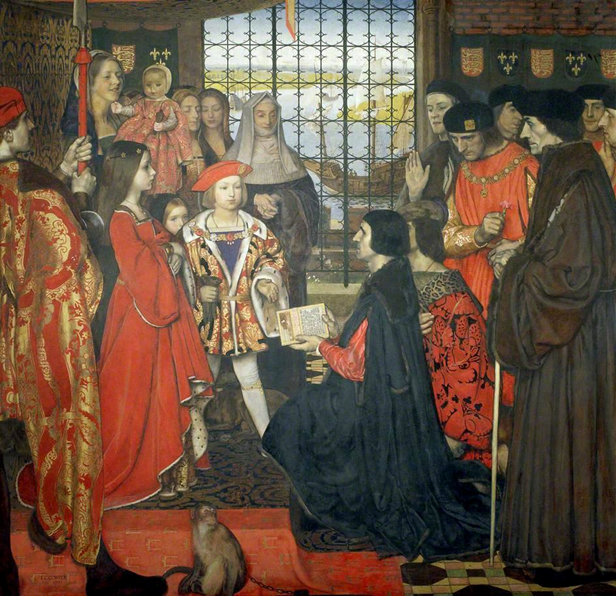 Whether Henry VII liked it or not, growing up in his grandfather’s palace, with his grandfather’s possessions and staff around him, the young Henry could not help but be aware of him, and influenced in some degree by his memory. As Henry grew from infancy into a small boy new siblings arrived, and some departed. 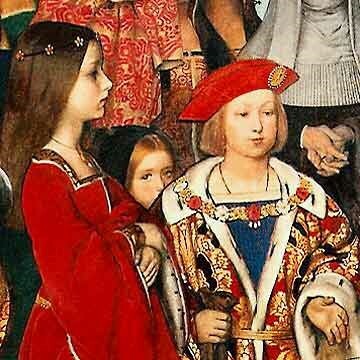 When Henry was just four years old his sister, Elizabeth, who had blossomed briefly into his life died suddenly in September 1495 aged just three years old. What affect this loss of a playmate may have had is impossible to say. Childhood death was commonplace in Tudor England but that doesn’t mean it wasn’t difficult. As humans we never get used to death. Henry would have missed her. He and Margaret might have been lonely. It was his first brush with death and the loss perhaps made him wonder and worry a little. In 1496 Elizabeth’s place in the nursery was filled by another sister, Mary and a brother, Edmund followed in 1499. Sadly, like Elizabeth, Edmund did not survive for long but Mary has long been regarded as Henry’s ‘favourite’ sister. The lesson Henry learned from this was that childhood was dangerous – sons and daughters could be lost. His father, beset by rebellion, was made more insecure by the loss of each child; Henry must have noticed this and soon, the lesson would become further ingrained. In 1491 a man claiming to be the younger son of Edward IV arrived on the scene. We now know him by the name of Perkin Warbeck and it is widely accepted that he was an imposter, a base born son of Edward IV, or perhaps someone who just happened to bear a family likeness. Regardless of who he was, Henry VII seems to have been rattled by his claim. Warbeck had the backing of France, Burgundy and Scotland; the powers of Europe were ranged against the unstable claim of Tudor and the king had plenty of reasons to be worried. England was home to many supporters of York; men who would go to any lengths to reinstate the old Plantagenet line. Some would even go so far as to accept an imposter. The fact that the king was so unsettled by Warbeck’s claims could suggest that he had no idea if the princes of York were living or dead. In order to marry Elizabeth Henry repealed the act, titulus regius, that had made her and her brothers illegitimate and allowed the crown to pass to their uncle, Richard III. In reversing the act, legitimising his wife and turning Richard into a usurper, he also made the missing princes (if indeed they were still alive) legitimate also. In validating their blood, he also validated their claim to the throne …before himself. Imposter or not, neither Henry nor Elizabeth welcomed the return of a son of York this late in the game; as much as Elizabeth may have loved her brothers, she was queen now and in all probability, would have wanted the crown to pass to her own son, Arthur. It was time for the Tudors to show their trump card; their two strong, healthy, legitimate sons. 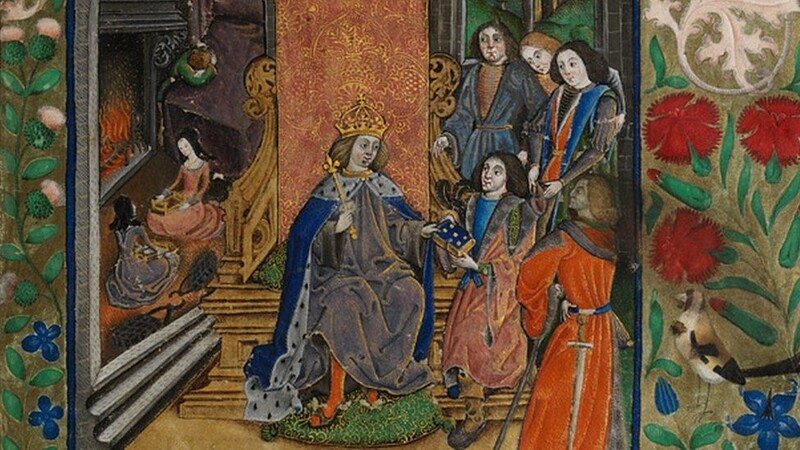 In an unspoken yet eloquent declaration Henry bestowed many of the titles that had belonged to the younger York prince, Richard of Shrewsbury (whom Warbeck was claiming to be), onto Henry. This action spoke louder than any words. The Princes of York are gone but, in their place, here are my sons; the princes of the house of Tudor. The extravagant formalities that made the young Henry a royal duke were his first introduction to ceremonial bling and began a love affair with pageantry that would last his whole lifetime. Henry VII had spent his youth in a similar vein to that of Warbeck. He was exiled, unsure whom he could trust, the future a dark unfathomable void. He would either become king or die in the attempt. The king knew only too well how tenuous the counterfeit prince’s survival was. Henry VII sent spies far and wide trying to capture him, made constant attempts to persuade or bribe Warbeck’s supporters to hand him over. And during this time he also continued to parade his legitimate sons in the face of Warbeck’s on-going claims. The situation dragged on until 1497, when Prince Henry was six years old, and the Cornish, fed up with Henry’s taxation laws, rose up in favour of Warbeck against the king. While Warbeck rode south with Scottish troops, the Cornish marched on Black Heath from the west, throwing the royal family into panic. While the king called his men to arms, Elizabeth of York fled with her children to the safety of the Tower. Just as in her youth, during the wars of the roses, when she was forced to take refuge with her mother in the Tower and later in sanctuary at Westminster, she must have been afraid and vulnerable, the future uncertain. She had no way of knowing the outcome and she could not be convinced that her husband would triumph. Her overriding fear must have been that her own children might shortly join the ranks of her missing brothers. The walls of the Tower were thick impenetrable stone, she was as safe from physical danger as it was possible to be, but the memories, if not the ghosts, of her brothers, must have cried out to her from the shadows. Her children must have sensed those fears and been terrified too. Luckily for Henry, Warbeck was captured and thrown into the Tower, (eventually to be beheaded on dubious charges that warrant another blog post) the rebels were punished and the royal family resumed their lives. The King and his council continued to govern, Elizabeth continued to oversee the upbringing of her children and Henry and his sisters continued with their education. Henry’s first teacher was John Skelton, a poet and philosopher under whose instruction Henry’s fertile mind flourished. In 1499 the Dutch scholar Erasmus and his friend Thomas More visited the nine-year-old prince at his home in Eltham. Erasmus remarked afterwards on Henry’s ‘dignity of mind’ and ‘courtesy,’ and it seems the prince was not slow in coming forward either. When Thomas More made a gift of a literary composition to Henry, Erasmus was embarrassed not to have anything of his own to offer. He was angry with More for not warning him that an offering was expected. The oversight did not go unnoticed and afterwards at dinner, the young Henry issued the scholar a challenge to write something for him. Erasmus spent the next three days hastily composing one hundred and fifty three lines of verse dedicated to the prince. (Erasmus’ Prescription for Henry VIII) The incident began a correspondence and friendship that was to last many years. On 14th November 1501 a great royal wedding took place between the Prince of Wales, Arthur, and the Spanish princess, Catherine of Aragon. 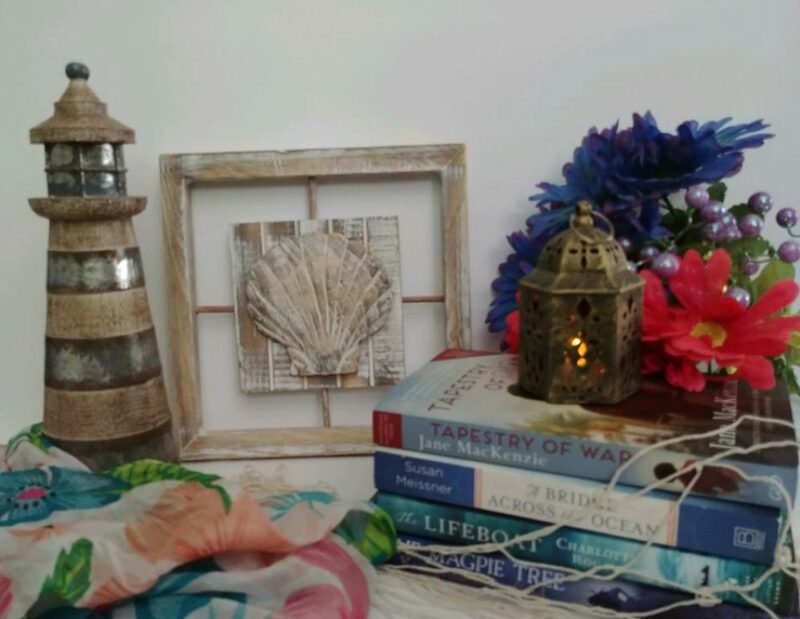 The couple had been betrothed since they were three years old but it was only now, with Warbeck no longer a threat, that they were considered of an age to marry. The wedding took place at St Pauls and it was Henry who led the princess ‘from the Bishop’s Palace, across the churchyard of St Paul’s, through the west doors and along the elevated walkway to the wedding platform.’ (Starkey p 144) Then, after the ceremony, he led her back again to be united with her husband at the door of the bridal chamber. This is the first recorded sign we have of the joy loving figure Henry would become and the picture of the chubby ten year old prince dancing in his shirt sleeves is an endearing one. The boy took a risk but it was a calculated one. He knew it was breaking the rules but he also knew there was nothing his father could do to prevent it – not until later when the revel was over. Unfortunately the king’s response to this breach of etiquette is not recorded but it is the first indication that Henry was the sort of boy to go his own way. For several weeks after the wedding great joy was held throughout the kingdom, but the joy was not to last. In less than five months, Arthur, the Prince of Wales, was dead, Catherine of Aragon was widowed and the king and queen were devastated. The death of his older brother marked a great change for Henry. No longer the second son his status was drastically altered; his life never to be the same again. Henry, Duke of York, second son of an unpopular monarch was now thrust into global prominence. But, having lacked the strict male upbringing of his older brother, Henry was not ready to be Prince of Wales, and he was certainly not ready to be king. He had a lot to learn and he would have to learn quickly. Henry VII and Elizabeth were plunged into deep mourning. Records tell us that their grief was profound, Elizabeth was summoned to the king’s chamber to comfort him and she is reported to have reminded her husband that they were lucky to have in Henry another ‘fair and goodly prince,’ and that they were yet young enough to have other children. There is some suggestion that sexual relations between the two had ceased sometime previous to Arthur’s death but necessity brought them together again and, as good as her word, Elizabeth quickly fell pregnant. Since the day she became Henry’s queen, cementing the union of York and Lancaster and end the wars of the roses once and for all, Elizabeth had done her duty and never put a foot wrong. Now, if she could give the king another son, the Tudors would be secure again with, to use Starkey’s term both ‘an heir and a spare.’ But before the year was out Henry’s mother was gone, she died on 2nd February 1503 shortly after giving birth to a daughter, Katherine; a little girl who followed her mother to the grave a few days later. For a boy like Henry; outgoing, active and physically agile, this virtual imprisonment must have been hell and possibly exacerbated the grief he was no doubt suffering for the loss of his mother. An illustration in a book of illumination discovered a short time ago in the National Library of Wales depicts the aftermath of Elizabeth of York’s death. The king, dressed in mourning, is being offered a book and, in the background his daughters, Margaret and Mary, are wearing black veils. Somewhat apart from the others, a young boy with red hair weeps onto his mother’s empty bed. It is a picture of segregation and solitude; a sad, heart wrenching illustration of a formerly ebullient prince. 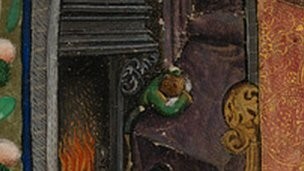 1503 marks the end of Henry’s childhood. The future yawns wide and empty before him. His childhood with its stories of chivalry, the warm nurturing presence of his mother and nursery staff is unreachable. He cannot return to the time of joy that went before. In a short time he has lost his brother and his mother and been thrust from a fairly predictable future as a royal Duke into the terror of the unknown trials of monarchy. Henry’s early status of ‘second in line to the throne’ would impact upon every aspect of his upbringing and it was perhaps this early need to play second fiddle that fed his later desire to be centre stage. Nobody, least of all Henry, knew what sort of king he would make but his early lessons stayed with him. Henry would continually seek the unconditional love he’d known from his mother in his early years; he would strive and fail to become the perfect renaissance prince that his early teachers, Skelton, Erasmus and More had impressed upon him; and he would also strive and fail to fill the royal nursery with sons as his father would have wished. 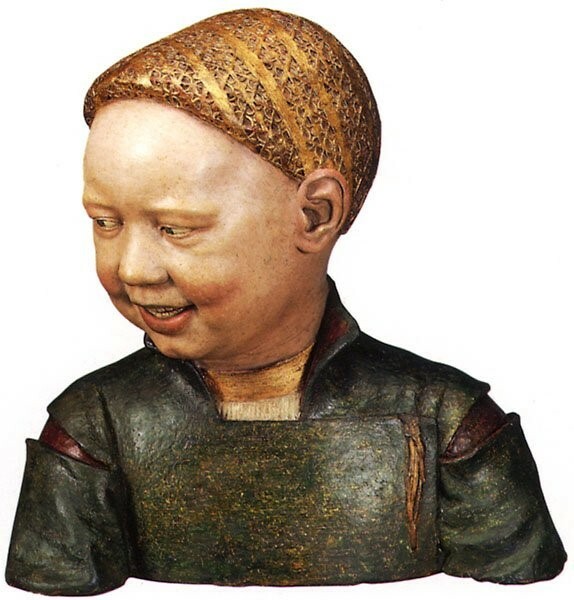 “Laughing child, possibly Henry VIII, c.1498. Possibly commissioned by or presented to Henry VII. Guido Mazzoni“from the royal collection. 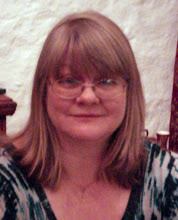 Judith Arnopp is the author of six historical novels. The first three are set early in the historical calendar in Anglo Saxon and Norman Britain, the last three in Tudor England. She is currently working on her seventh A Song of Sixpence which tells the story of Elizabeth of York, mother of King Henry VIII. The Forest Dwellers: set after the Battle of Hastings. The Song of Heledd: set in 7th Century Powys. The Winchester Goose: at the court of Henry VIII. This entry was posted in Uncategorized and tagged Henry VII, Henry VIII, Judith Arnopp, Tudors by layeredpages. Bookmark the permalink. I really enjoyed this article. It follows on so clearly from Richard III’s life and fills in some gaps in my knowledge.